Scientists have found a rare frilled shark, a living fossil that has remained basically unchanged since the time of the dinosaurs. An astonishing find off the coast of Portugal has the scientific world talking, and is the latest example of yet another fascinating finding in the Atlantic Ocean. 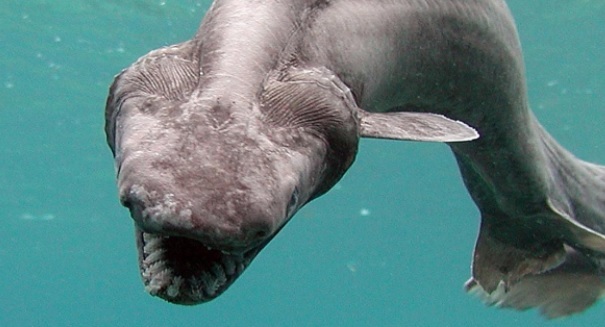 A research team came upon a frilled shark, a rare creature that is often called a “living fossil” because it has not changed in 80 million years, stretching back to the time of the dinosaurs. Scientists conducting a research project for the European Union aimed at minimizing unwanted fish catches by commercial operations came upon the frilled shark, which is so rarely seen because it lives 390 to 4,200 feet below the waves. While frightening looking it is not a danger to humans. It’s just the latest in some incredible discoveries we’ve made in the Atlantic Ocean in recent years, indicating this is truly a Golden Age of science. Scientists recently found a massive waterfall under the sea in an area between African and South America. Water pours down from a massive height, as two currents push against each other with different speeds and temperatures. An alarming finding this century was that a new subduction zone could eventually make the Atlantic Ocean disappeared in just 220 million years. A subduction zone is when a tectonic plate pushes underneath another one, and then it melts back into the mantle. This would create a huge mountain range that would cause the Atlantic Ocean to vanish.